This is a sight that is probably not in most Savannah tourist books. 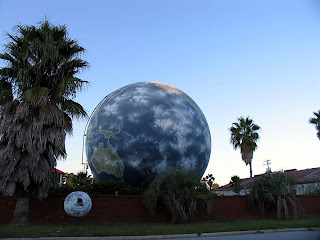 A globe (not quite built to scale) advertises the Savannah Mortgage Company. I've passed it many times while driving on Abercorn street. I'm not sure if there is anything in it. Could be just a big billboard. And I'm not sure what a mortgage company has to do with a large globe anyway. Another unsolved mystery of Savannah!